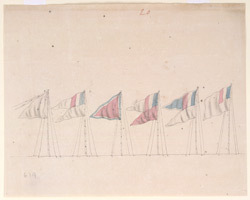 Watercolour by Colin MacKenzie (1754-1821) of flags of the French Corps at the Nizam of Hyderabad's encampment, dated between 1795 and 1815. After the third Mysore War the French at Hyderabad were actively intriguing to gain the Nizam's support for Tipu Sultan against the British. Raymond with a number of French officers had organised a body of regular troops.